My high hopes didn't make it that far though ~ I did make a birch bark costume for halloween but that was about it! I decided it was time to use up some of my collection and thought attempting a basket might be just the project. To begin you can follow this simple patten I found. Fold your birch bark on all the lines. Add moss on the edges by laying down a line of glue and squeezing it on. Cut a strip of bark for your handle and glue on. 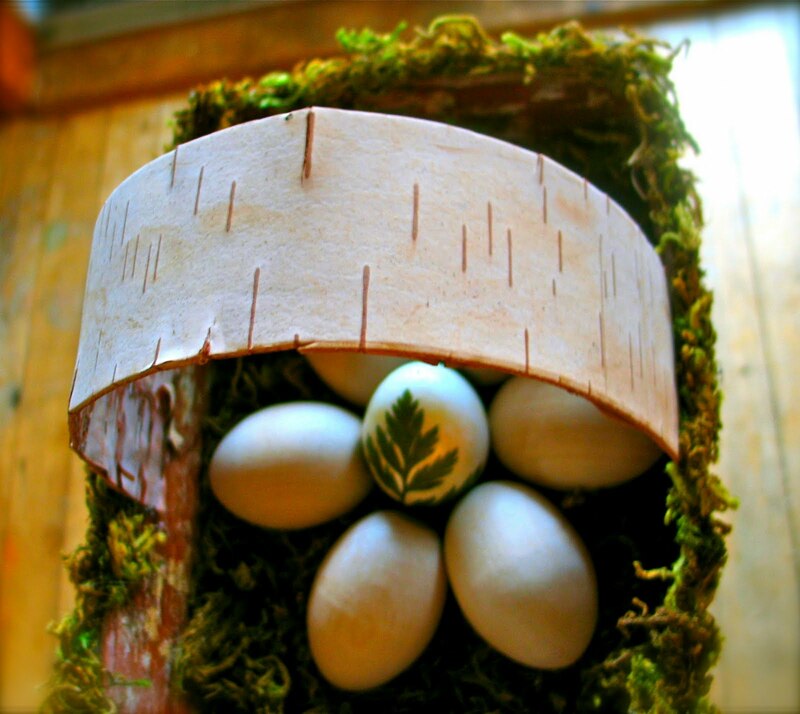 Fill your basket with moss, grass, straw... and there you go ~ a sweet little basket to put Easter delights in! He is a well loved little guy that Luna saved up many many allowances to buy! A wee wonderful pet that we have all fallen in love with. On my daily walks I see some really beautiful birch bark trees, now I am going to have to go see if there is some one the ground. LOVE this idea and your napkin rings idea too. You girls are so full of inspiration and crafty goodness!! Thanks so much. 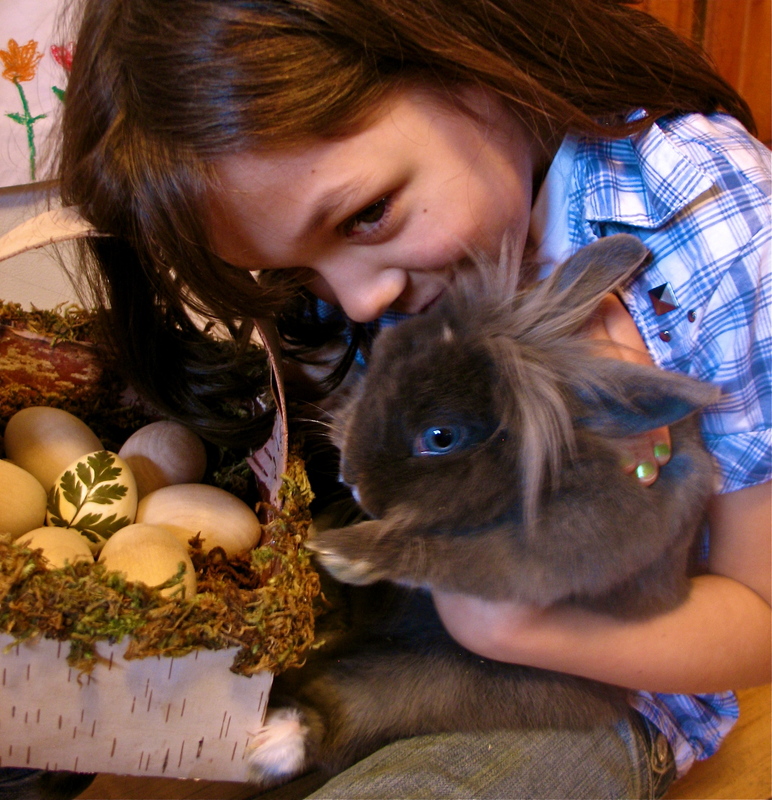 Beautiful basket, beautiful girl, beautiful bunny! Check out his hair!! I miss my bunnies, and my daughter just started asking for one but my husband swears we can never get any more pets, lol (we have two very high maintenance cats). what an amazing material birch bark is I'll have to keep a look out for it in future. That is fabulous! I now need to find a birch tree and watch for scraps to fall. That Bunny looks sooooo cute! ilke you could plait it. Oh, I just love these. Thank you for sharing. What beautiful little baskets! Wish we we had birch trees around here... I think we are a bit too far south! So sweet.. love the basket.. also wondering, what breed bunny is that? We're right now in the process of getting some, but haven't one hundred percent settled on the breed. 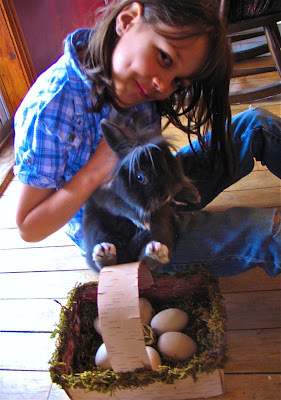 (BTW, it's not an EB (easter bunny) we're getting, but a pet that my son has wished for since he was way little. Monika and Jules... It is a lionhead lop bunny. They are said to be (and ours seems to be) Very laid back, easy to house train, with a great temperament. I never would have really thought about a bunny for a pet for us but it has worked out so well. LOVE that basket. Thank you for sharing the pattern. When we gather birch bark to make little canoes for the boys I'll want to try making a basket for me. This is just gorgeous!!!!!! Beautiful pics too. Especially that last with your little one and the bunny! Adorable! skylar is such a cute bunny. Luna most of really wanted him if she saved up all her allowance for him. Will I guess she originally wanted a her but she still loves him.